In March 1924 Mildred Garland helped to form a company of Girl Guides for all girls between the ages of 11 and 16. Patrol leaders paid subs of 2d and the other girls 1d. The guides formed into various patrols including Kingfisher Patrol. Mildred was patrol leader, and other members were Edith Gibbs from Longsplatt, Betty Hancock of 24 Middlehill, Phyllis Dobson from The Market Place and Ethel Baxter of Box House Cottage. Within a year they had been joined by Lilly Clarke of Devizes Road, Ruby Eddols of Wadswick Farm and Rita Milsom from the Rising Sun. From the first days, the Box Troop of Girl Guides was keen on putting on plays and theatrical sketches. One of the first ones was a church social in the Bingham Hall in January 1925 to welcome the new vicar Rev George Foster, who had been inducted three months before. The entertainment included a series of tableaux, cleverly portrayed by the Guides. Hilda Louise Nicholson from Wimbledon, London, was one of the teachers at Box Girls' School in the 1920s and a keen proponent of theatrical events. Away from work, she was an active member of the Corsham Baptist Church and a leader of the Box Girl Guides. The Guides appeared in a social evening at the Bingham Hall in February 1925 as part of a newly-formed Recreation Club. The idea was the inspiration of postmistress Esther Fudge, who wanted to promote entertainment for young people in the village. Dancing, folk songs and amusing sketches were all put on by young residents of the village. Rev George Foster appeared with various humorous songs. ​It was natural that the Guides wanted to join in the Roaring Twenties celebrations. It wasn't the Great Gatsby for Box youngsters but the girls were the Bright Young Things of the age. There was peace after the Great War, the new music craze jazz, and greater freedom from parental restraint with growing prosperity as the decade of the 1920s grew to a close. ​​​A prominent member of the Troop was Constance Betty Hancock, daughter of Mr and Mrs J Hancock of 2 The Ley, seen left.in her teens. She was described as a young lady of remarkable literary and dramatic gifts, connected with Box and Ditteridge Churches and did much charity collecting for various organisation. [a] She was often referred to as a friend to many who knew her. In August 1925 the whole Troop went on a camp to Hope Barton Devon. It was obviously great fun as these photos show, the first time away from home for many of the girls. ​Naturally there was plenty of outdoor exercise for the girls including hiking and early morning dips at Hope Cove. Mildred Garland’s organisational skills flourished in the Guides, eventually becoming Patrol Leader in the Rangers with the older Guides. But by the 1930s she and many of the senior girls were in a relationship or married and starting their own families. A new group of leaders took over. 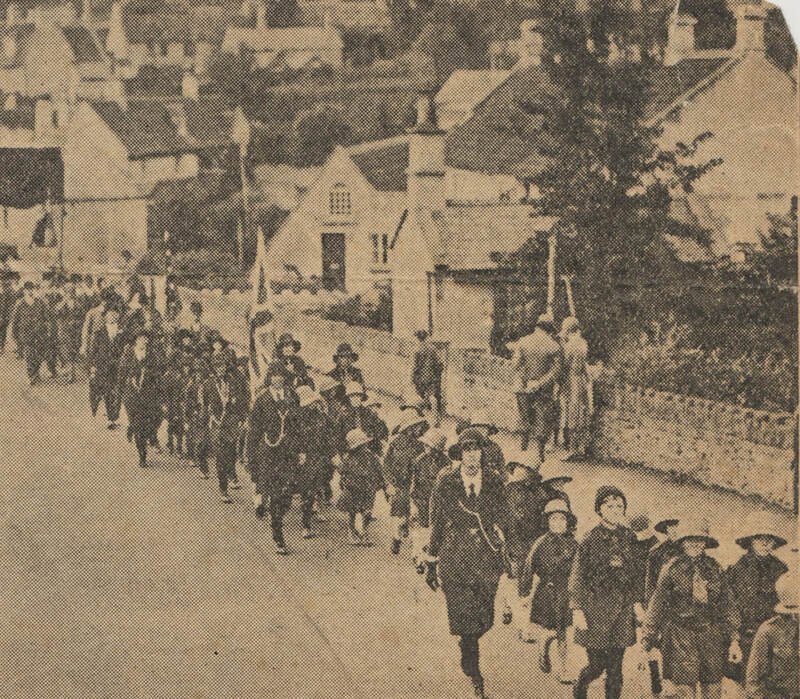 By 1931 the Guides had a younger troop of Brownies accompanying them. Under the leadership of Miss EL Oatley and Miss Beardmore they raised funds at a jumble sale in the grounds of Box Schools, organised by the Hon Mrs Shaw Mellor. After six years leading the Guide troop Miss Oatley left the organisation in September 1931 to take up a nursing appointment in London. ​Because of the age of the young leaders, the organisation had frequent changes in leadership. Barbara Pinnock and Tessie Hemmings were actively involved. By 1937 Miss Grace Toy was captain of the troop and Miss Gladys Chaffey was lieutenant. Later that year Miss Toy married John R King of the Bath Ambulance Service. Their wedding, seen left, had a double guard of honour by the 1st Box Girl Guides and the St John's Ambulance troop at the Methodist Chapel in July 1937. But, shortly after, these leisure activities ceased when everybody’s attention was on the war effort. The Guides and the Rangers lost leaders and recruits dried up. The troop had to be disbanded and it was only in 1972 that the Guides Restarted.